As humans use the Monkton-Vergennes Road to commute between work, home, and recreation, wildlife needing access between upland overwintering habitat and vital breeding wetlands also travel through this corridor. The rare Blue-spotted Salamander is among the large and diverse group of amphibians that inhabit the rich natural area surrounding this increasingly busy road. 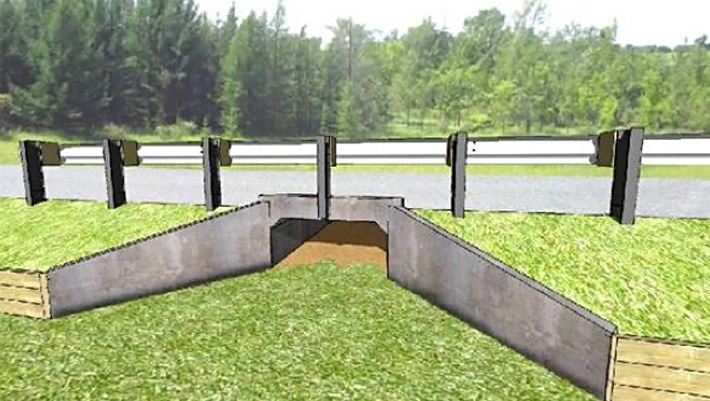 In 2005, the Monkton Wildlife Crossing Project began as concerned citizens realized that this population of amphibians was threatened by increasing traffic. Working with the Vermont Reptile and Amphibian Atlas’s Jim Andrews, the Town of Monkton, VTrans, and others, Vermont's first amphibian crossing tunnels have allowed thousands of salamanders and frogs to safely make their critical annual journey to and from their breeding pools. Lewis Creek Association and the Town of Monkton led a joint effort to build this much needed infrastructure. Ecologists, engineers, and the Monkton road foreman concluded that the only long-term solution to ensure the sustainability of this extraordinary population of amphibians was to retro-fit the existing roadway with wildlife crossing tunnels. With support from the Vermont Agency of Transportation, this is the first wildlife-related project in Northeastern United States to receive a Transportation Enhancement Grant from the Federal Highway Administration. Funding came from the aforementioned grant, as well as a state wildlife grant, Lewis Creek Association direct mail, an Indiegogo campaign, and several awards from the Davis Conservation Foundation, Sally Laughlin’s Meeri Zetterstrom Award, and Defenders of Wildlife/TransWild Alliance, and was supported by a variety of local organizations. The project has received international attention for its innovative approach to reversing an ecological tragedy. News outlets from as far away as Sydney, Australia, were covering the story within hours of its announcement. Status: The amphibian crossing construction is complete; final enhancements were added in 2018. This video depicts salamanders and frogs moving through one of two amphibian underpasses in Monkton VT. Photos were taken every minute for one hour in the spring of 2016. Between March 10 and May 3, 2016, there were 2,208 amphibian crossings in the two culverts!